The following is Part 1 of the early release of findings from research on the leading female directors on California top corporations -- a survey being conducted for the third year in a row by Champion Boards. Champion Boards is a service of Santa Monica-based Technology Place Inc. -- designing great boards of directors through knowledge and information. Elizabeth Ghaffari, project director, established Champion Boards as an advisory service for female candidates for board roles, to help women prepare themselves to pursue board opportunities . . . intelligently. The Hype or The Reality? Most of the popular media complain that corporate boards are "at fault" for failing to place women on their boards of directors. But the popular media fail to recognize how much blame should be placed at the feet of state economic and legislative policies. These factors contribute much more to the economic viability of firms in a given market area. And when the firms do not succeed, then there are fewer successful corporate boards on which women can serve. 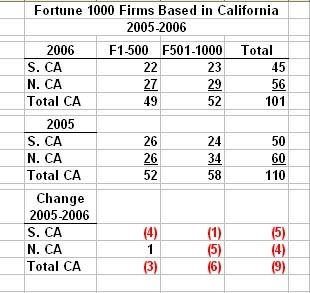 In the past year alone, a total of 17 firms went off the California Fortune 1000 list due to their relocation to other more economically-favorable states, or because they were bought out, merged with other firms located elsewhere, or went private or bankrupt. Fourteen of those firms had a total of 26 female directors, many of whom will not be absorbed into the acquiring company's board of directors. The others had zero women directors. This is in addition to the total of 27 women who retired from boards of directors at California Fortune 1000 firms in 2003 and 2004. One other women passed away (Jane Evans, former director at KB Home). Thus, in the past three years alone, California experienced the elimination of 54 board seats formerly held by female directors. With the exception of Evans, the losses were due to the changed economic circumstances in the corporations themselves, but also because of retirements or resignations by the women themselves. These factors would suggest that the women and companies alike faced difficult challenges as they considered expanded diversity on their boards of directors in 2006.
the economic "big picture" includes retiring female directors -- a trend that occurs because of decisions by the women themselves, based on their age, tenure and personal career goals and objectives. decision by the women themselves. 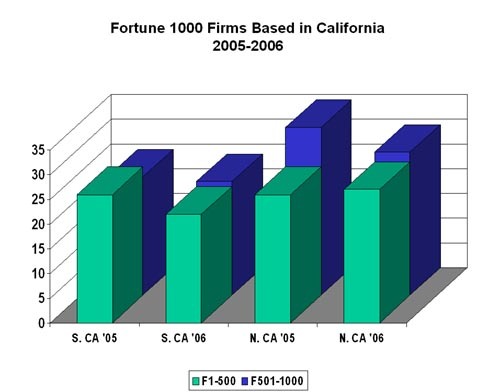 California's dominance is due to a slight margin in the "bottom tier group" or the group rated #501 to #1000 among Fortune 1000 firms. In the April listing, California had 58 of the "bottom tier" companies compared to 46 located in Texas and 37 located in New York. 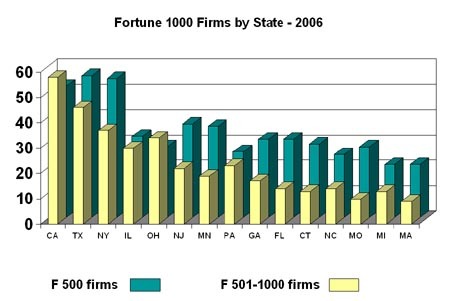 Among "top tier" Fortune 500 firms, Texas led with a total of 56 firms; New York was second with 55 and California was third with 52 firms at that level. The 9th addition to the list was Earle M. Jorgenson of Lynnwood, which was subsequently acquired by Reliance Steel & Aluminum. It was another bad year for California in that several firms moved out of the state, declared bankruptcy, or merged with other firms. This is a trend that the Los Angeles Economic Development Corporation (LAEDC) has been monitoring closely for the past 3 years, including direct communications with the Governor regarding a loss of almost 100 top corporations from the state. According to the LAEDC, there are possibly another 3 top California firms that are evaluating putting themselves on the block or at least reducing their footprint in the California marketplace. If this trend continues, women on boards of directors will be less of an issue compared to the more fundamental challenge of how to keep major public corporations in our state.